Coat a shallow baking dish with nonstick cooking spray; set aside. Trim the fat from the chicken. Pound chicken with a meat mallet to 1/2-inch thickness. Set aside. Heat a skillet over medium-high heat. Add the mushrooms, onion, wine, oregano, garlic, and pepper; cook, stirring, about 5 minutes or until the onion is tender. Add kale; cook, stirring, until wilted. 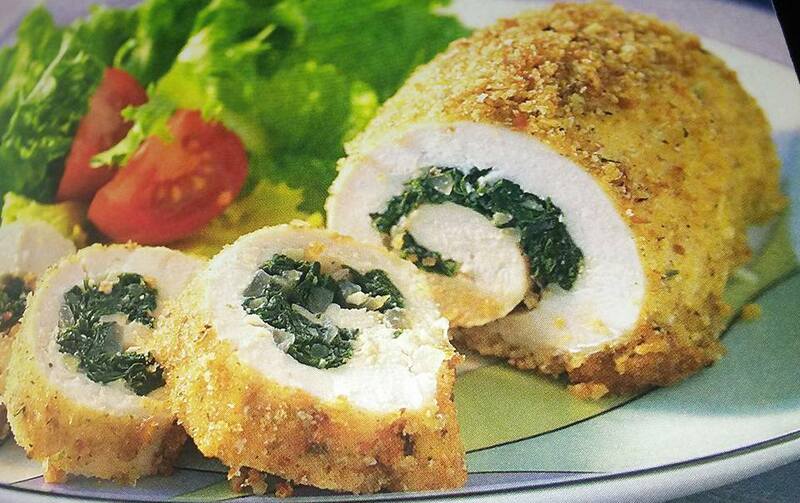 Spread the kale mixture evenly over the flattened chicken; roll up and secure with toothpicks or metal skewers. Brush with the mayonnaise and coat with the bread crumbs. Bake at 400 degrees for 25 minutes or until chicken is a golden brown and no longer pink. BE SURE TO REMOVE ANY TOOTHPICKS BEFORE SERVING! This recipe and photo are from Diabetic Cooking.